Last May 24's Balik Bukid Country Fair saw people borrowing local mats to use for picnics, shopping for organic products (from produce to scented products, even toys), buying plants for urban farming, stocking up on naturalist medicines and just enjoying everything that's fresh and fun there to do and sell. Good thing there's a part 2 happening on November 17, 2012. 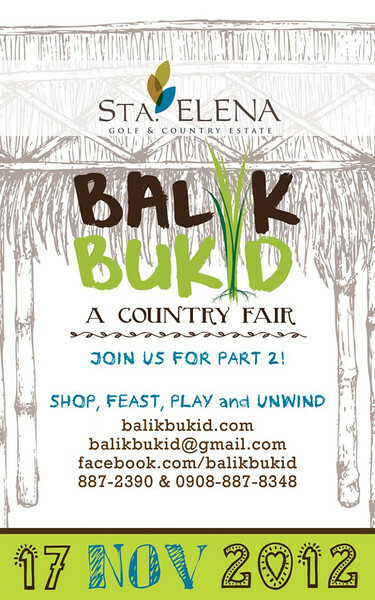 Entrepreneurs wishing to sell their organic products can contact balikbukid at gmail dot com while families can rally their friends and clan to have a family day at Sta. Elena Golf & Country Estate.